Jim Serrett Studio: Inspiration is for amateurs; the rest of us just show up and get to work. 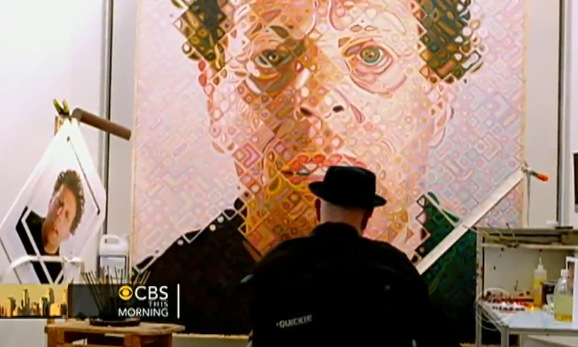 This is a fascinating glimpse into a amazing artist with a unique philosophy of life. Well worth the watch. True inspiration. If you don’t know much about Chuck Close’s life you should definitely investigate, as his life and times are as interesting as his works of art. "Every great idea I've ever had grew out of work itself." 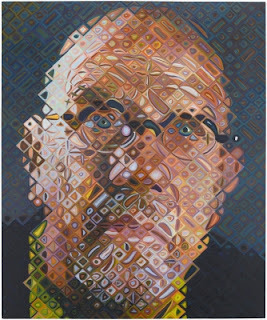 Chuck Close is an amazing artist and an amazing person. Thanks for sharing these truths! "NEVER let anyone define what you are capable of by using parameters that don't apply to you." is a jem. I love it! Love Chuck. Well.....I must be an amateur because I can't help but feel inspired. Nice find Jim!